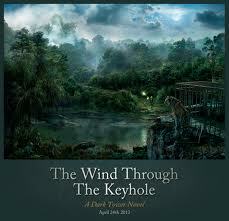 The Wind Through The Keyhole. This was published after all the Dark Tower books were released and is set between “Wizard and Glass” (Dark Tower IV) and “Wolves of the Calla” (Dark Tower V). As with “Wizard and Glass”-this addition is “a story within a story within a story” and has been labeled “The Dark Tower 4.5." Roland, Susannah, Eddie, Jake and Oy arrive at a river and an old timer who runs the ferry across feeds them and takes them to the other side. He warns them of a coming “starkblast” which Oy has been sensing since the very beginning of the book. It is a violent storm that will kill whatever is exposed to it’s chill. They find shelter in a building just up the road and as they secure their location and “hunker down”, Roland begins a tale of when he was a young gunslinger. “The Skin Man” storyline: Roland and his friend Jamie DeCurry are sent out by his father to the town of Debaria on a mission to capture a skin-man; a being that can transform into any creature it wants. It is ravaging the town and help was requested by the town sheriff Hugh Peavy. Their train derails outside the town of Serenity, an Amazonian community of women where his mother went for her mental breakdown following her affair with Marten Broadcloak (aka Randall Flagg). After they fill them in on attacks that happened to them, Roland and Jamie head to Debaria. After meeting with Sheriff Peavy and investigating the attacks that have happened previous to their arrival, they come to the conclusion that it must be a salt miner from the nearby village. A local farm is attacked by the skin man that night and the only survivor is a young boy named Bill who is now orphaned. Bill, under hypnosis by Roland, says he saw the skin man change back into his human form but only caught a glimpse of his feet and a small blue circle tattoo. Roland sends Jamie to round up all the salt miners and have them come to the Debaria jail where he will walk each one past Bill to identify. Bill is scared that he’ll be killed for identifying the skin man, so Roland tells him the story of “The Wind Through the Keyhole”. “The Wind Through the Keyhole” arc: Tim Ross is a boy who is scared of the annual collection of property taxes by The Covenant Man. His dad was killed by a dragon in the woods, so his mother fearing poverty, marries his dad’s best friend Bern Kells. Kells is a mean drunk who abuses Tim and his mom. When the Covenant Man comes to his door to collect taxes, he whispers to Tim to meet him in the woods later. It is the meeting in the woods that the Covenant Man reveals that his dad was not killed by a dragon but by his best friend Kells. At that same moment, Kells is beating Tim’s mom until she goes blind. The Covenant Man tells Tim (via telepathy)if he comes back into the woods to meet him, he’ll give him magic to make his mother see again. Sensing a trap, Tim arms himself with a gun he acquires from a teacher and heads into the woods. He is mislead by an evil fairy named Armaneeta who almost gets him killed by a dragon and other swamp creatures. Thanks to his gun and friendly swamp dwellers, Tim narrowly escapes. The swamp give him a small mechanical talking device(GPS) from “the Old People” that helps guide him to his destination. Tim ends up at a Dogan where he finds a caged Tyger that has a key to the Dogan around it’s neck. A starkblast comes suddenly out of nowhere and so Tim befriends the Tyger and lets it out of the cage. They shelter themselves with a magic blanket. When the storm passes it is revealed that the Tyger is actually Maerlyn the white magician who was trapped as a Tyger by black magic. Maerlyn gives Tim a potion to cure his mother’s blindness and in turn, his mother kills Kells with an axe. THE END. At the end of this story, Jamie comes back with the murder suspects. Bill identifies one of the salt miners as the skin man because of his tattoo. The skin man turns into a snake and kills a couple of people around him until he is shot in the head by Roland who used a silver bullet. This story ends with Roland and Jamie leaving through Serenity where the women adopt Bill and give Roland a letter left by his mother long ago stating she forgave him for accidentally killing her. Now, the adult Roland realizes they’ve ridden out the starkblast and they pack their things up and head towards The Dark Tower.